When built my Kerzel hit and miss engine a few years ago, I intended to run cooling water in the reservoir to keep the cylinder cool, but I didn't want the cylinder to rust. 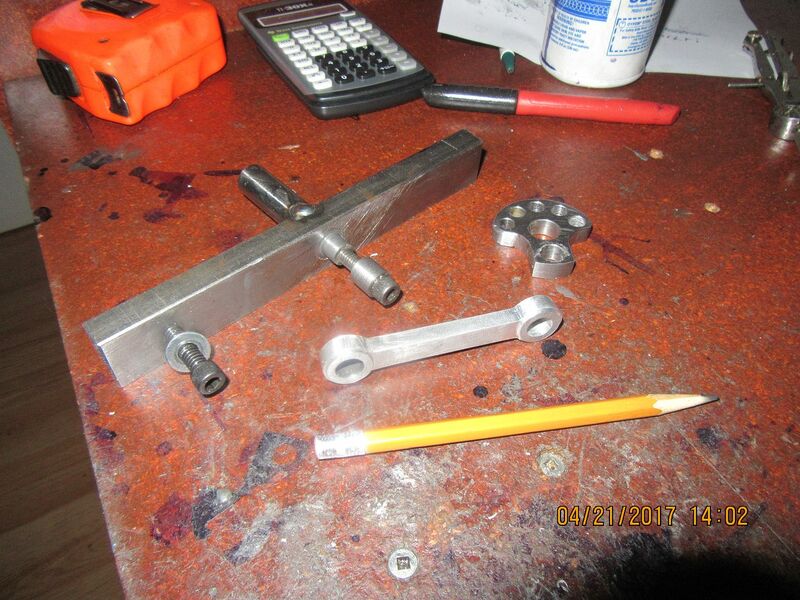 So---Not knowing any better, I made the cylinder from 316 stainless steel and the piston from aluminum. This has proved to be a very good combination of materials over the years. It seems to work fine when using a Viton o-ring and a bit of oil in the fuel. I don't think I would want to try it with cast iron rings, but it worked great with the much softer Viton. 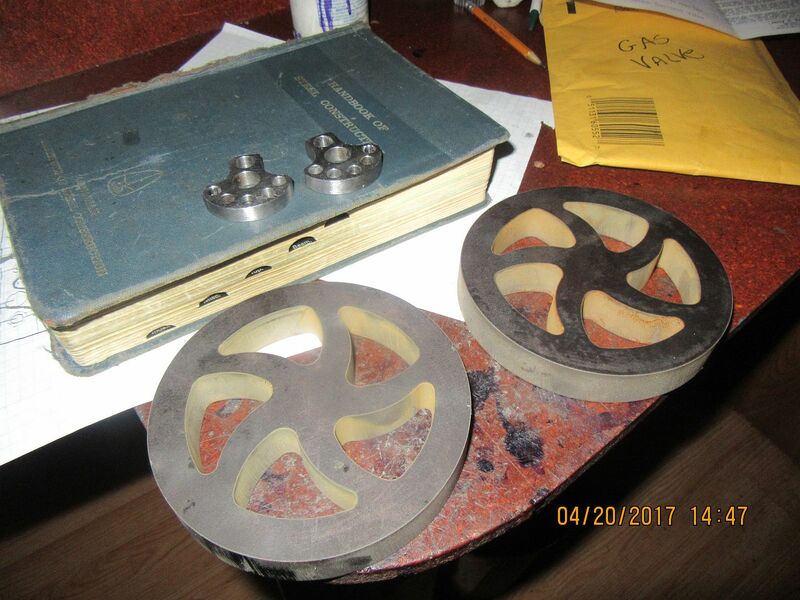 I just got a price to waterjet cut 2 curved spoke flywheels.---$69.50 each. So----I called the guy up and whined at him. The price dropped to $49.50 each. That's 2 1/2 hours setting at my computer designing something for a customer. If I tried to machine them myself I might be 80 years old before I got them finished. I said "Go ahead and make them!!" This should be very interesting. Don't ask!! This is about one of those "Having your cake and eating it too" things. 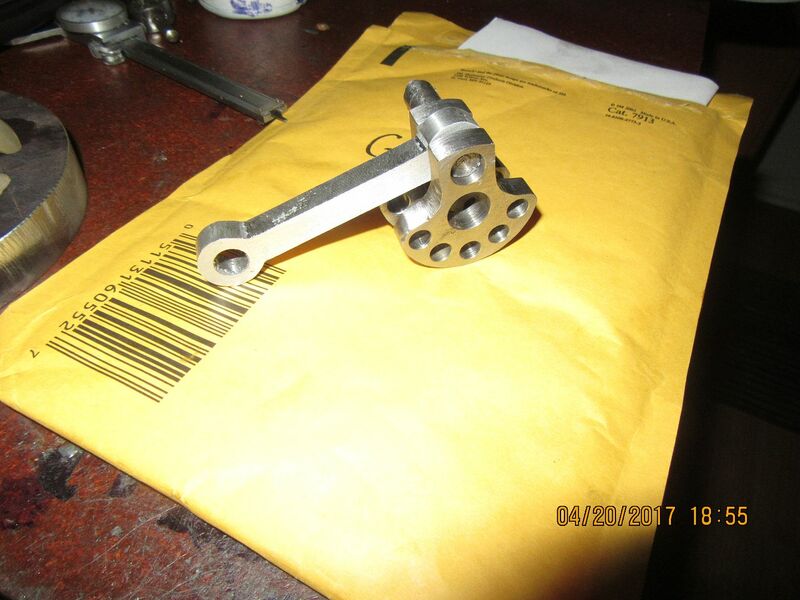 My "Gas demand valve" plans from Jerry Howell came today, along with some very small Tecumseh engine carburetor needle and seats parts and a diaphragm. 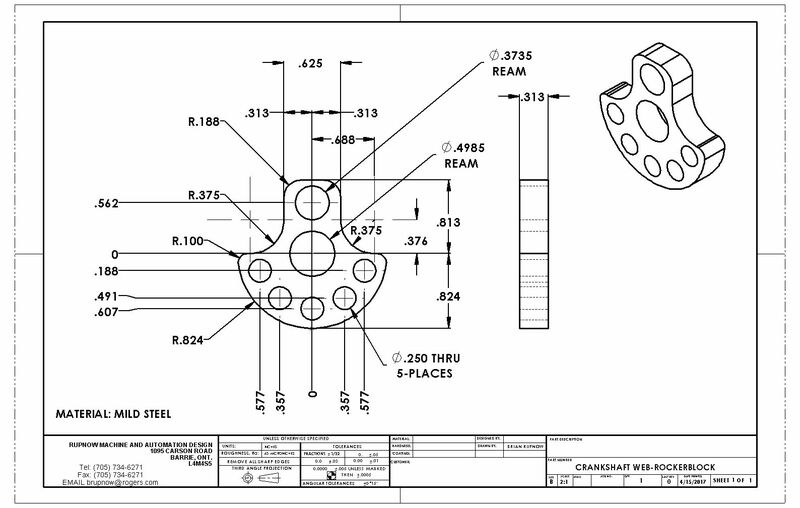 The detail drawing of the parts I have to make seem to be well done, but it's pretty damned sparse on assembly drawings. In fact, there are no "assembly drawings" as such, just printed instructions that eventually make sense after you have read them and taken all the tiny parts out of the bags and studied on them to see how this thing works. Apparently I now have to buy a propane regulator to use with this thing, and I have no idea what that will cost, but will try to find out tomorrow. I had an email today from the waterjet cutter saying I could pick up my curved spoke flywheels tomorrow, so I'm fair excited about that. I am going nuts right now with design work, to the point where I can't get time to do my own "hobby" stuff. I'm going to get bold here, and do something I haven't done before. 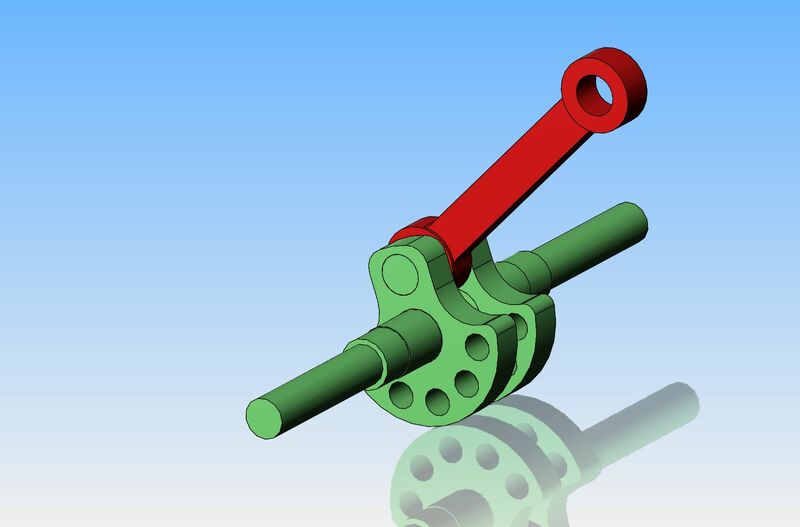 Since my crankshaft is built up from individual components pressed, Loctited, and possibly pinned together, I'm going to make up a one piece con-rod and assemble it with the crankshaft. If it works, then great, I'm way ahead of the game. If it doesn't, all I've wasted is a bit of time. Since this is a "demonstration" engine and is not going to see long hard hours of use, I'm not going to run any bearings on the con rod. Aluminum rod running on steel crankshaft lasts a long time if it is kept well lubricated. I'm not blazing thru this build like I have some others, but I did manage to get some machining time in today. The con-rod still has to have the center relieved, but at least I did something. I can't assemble the crankshaft until I have the con-rod finished so I thought this had better be a priority. 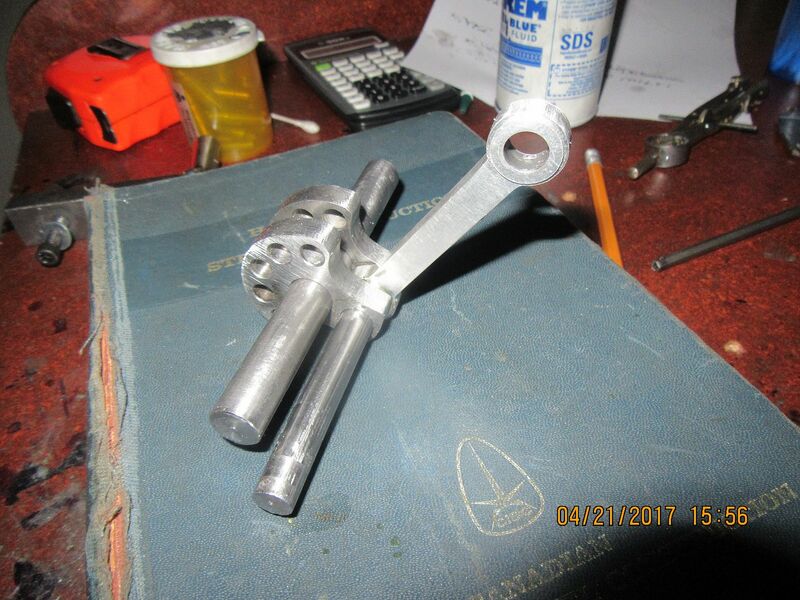 I got so tired of bodging up temporary fixtures to relieve the center portion of connecting rods that today I actually took an hour and built a dedicated fixture for it. I will post a clearer picture of it when I get the other side of the rod finished. It works like a charm. This is the finished con-rod, along with a shot of the fixture I made for relieving the section of rod between the two end bosses. The round rod in the center is turned to 3/8" x about 0.290" long. The remainder of the round rod is 9/16" diameter and passes thru a 9/16" reamed hole in the flatbar, and is welded a coupe of places on the side which fits into the chuck. The other bolt passes thru the far end of the con-rod and holds it snug against the flatbar, with the help of a flatwasher. The piece of flatbar which sticks out on the other side of center gives the fixture balance and can be tapped anywhere to accept a different length con rod. 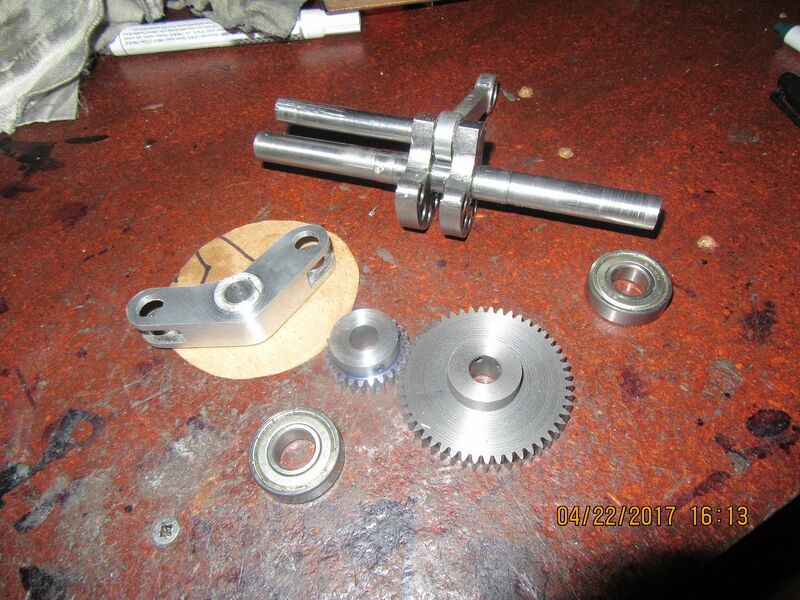 The first stage of crankshaft assembly is completed. There is a lot going on here!! The large shaft is an alignment shaft only, turned to be "size on size" with the largest holes in the web plates---not a press fit, but a damned close sliding fit. The small shaft is a piece of 3/8" drill rod, at about half a thou oversize. It is a hard press fit (with 638 Loctite) into and thru the first web plate (0.3735" hole), then wiped down with solvent, then oiled and fit thru the bore of the con-rod, then wiped down with solvent a second time and coated with Loctite 638, then pressed thru the second web plate. You don't see it, but there is a "washer" made from cardboard cereal box at 0.018" thickness setting on one side of the con-rod, because the con-rod is squeezed in there very tightly. After an overnight dry, I will make both ends of the crankshaft in one long piece and press it thru all in one blast. After the Loctite on it sets up, I will mill the piece out from between the web plates. Then I will soak the entire thing in water for a couple of hours to dissolve the cardboard washer and give the con-rod some side clearance. One thing to note---When you ream a con-rod to 0.375" diameter, a 0.3755" diameter rod will not fit thru it without pressing. I had to open the bore in the con rod by about .0005" to get a proper fit over the .3755" drill rod. I don't have any oversize reamers, so had to do a lot of persuading to get the bore opened out. This type of "persuading" is accomplished by sanding a taper on a piece of the drill rod in the lathe, coating it with cutting oil, and then CAREFULLY working the rod up and down the taper until it slides over the main diameter. I turned the ends of the main crankshaft down to match the 12 mm sealed ball bearings (that I already had) and left it full diameter in the center area that had to be press fitted to the webs. I coated the critical areas with Loctite 638, and since I have a limited throat opening on my vice, I did it in my two ton arbor press with a cheater bar about 3 foot long on the handle I had prepared a brass "cup" to fit over one end and had my 3 pound hammer ready in case I needed to do some constructive pounding to get things into home position, but they slid right into place on the arbor press, no "pounding" was needed. After pressing things into place, I set it up in the three jaw and checked for runout. Right now it has .008" total indicated runout, which isn't that bad. I just need that figure for comparisons sake when I mill the center portion out tomorrow. If it moves enough to trouble me, I will give it a few good whacks with the dead blow hammer to bring it "true". The jury is still out on whether or not I'm going to pin this crank together or not. Photobucket is being oinky today, but I will put up a picture when it decides to work for me. My little pile of parts is growing. Today I will finish off the crankshaft, and build the engine sideplates. I made the rocker yesterday afternoon, and for a simple enough part, there are a world of set-ups in it. I used my new con-rod fixture to relieve the material around the bosses on each side of the rocker, and it worked great for that too. And just for the fun of it---here is the crankshaft, luxuriating in it's custom made water filled bath-tub. 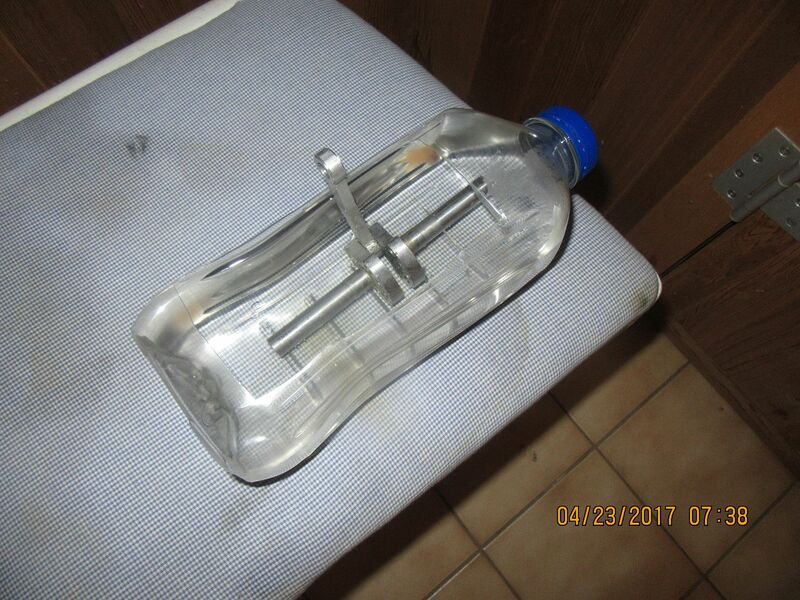 (which may have been a juice bottle at one time.) I trimmed away all of the unwanted parts this morning. Right now the con-rod appears to be Loctited to everything else, but I'm hoping that with a four hour soak, the .016" cardboard washer on one side of the con-rod will dissolve, and I can break the con-rod free of everything else. I may have to apply a little heat to the center of the con-rod and let it work its way down until the con-rod lets go and decides to turn for me. Well there!! I've had as much fun as I can stand for one day. Those sideplates aren't quite finished yet, but they are awfully close. I'm tuckered out. Those curved spoke flywheels are really, really nice.--But---Oh my God--What horrible little piggies to machine. The worst part is figuring out where to start. I opted to plunge at the major diameter of the recess in the side of the flywheel. Just because of the geometries involved, you can only plunge about 0.050" before the heel of the parting off tool starts to drag. Then you move in towards center the width of the parting off tool you are using to plunge with and plunge again. Moving back and forth between the two positions you keep plunging until you reach the depth you were aiming for. Then grind an HSS tool with the cutting face reversed to what you would normally see, and cut in towards the center in auto-feed mode, taking 0.010" depth of cut. This requires nerves of steel and eagle eyes on the digital readout. 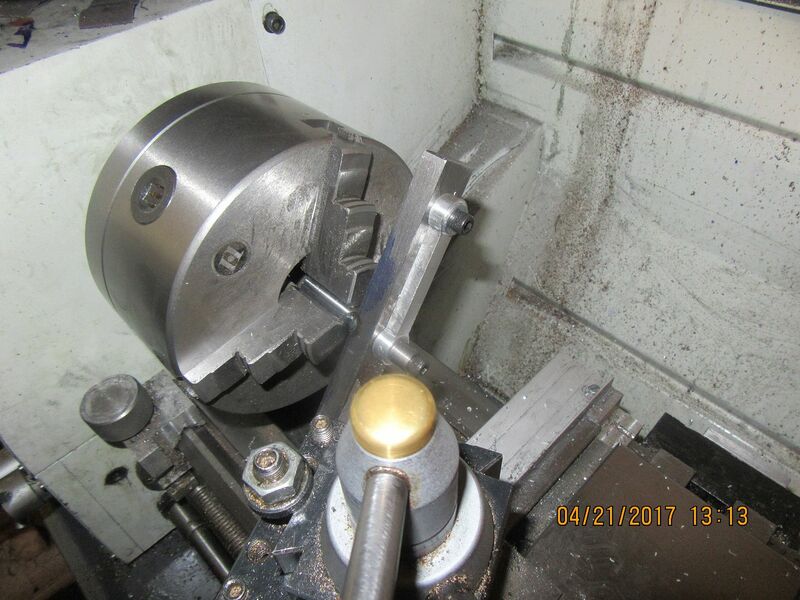 When you get about .050" from the minor diameter of the recess in the face, kick out the automatic feed and take the last .050" by hand feed. I have one side of one flywheel finished. I'm going upstairs now and have a strong drink now to calm my shattered nerves. See attached (large) pic for details. It takes a V-bottomed insert, so you can plunge AND cut sideways with it. SO with that particular tool, you'd plunge at between 60-75mm diameter, then cut inwards/outwards as required. That particular one is a bit of a fat one - requires a 6mm wide insert - they come in anything from 3mm upward (insert width). 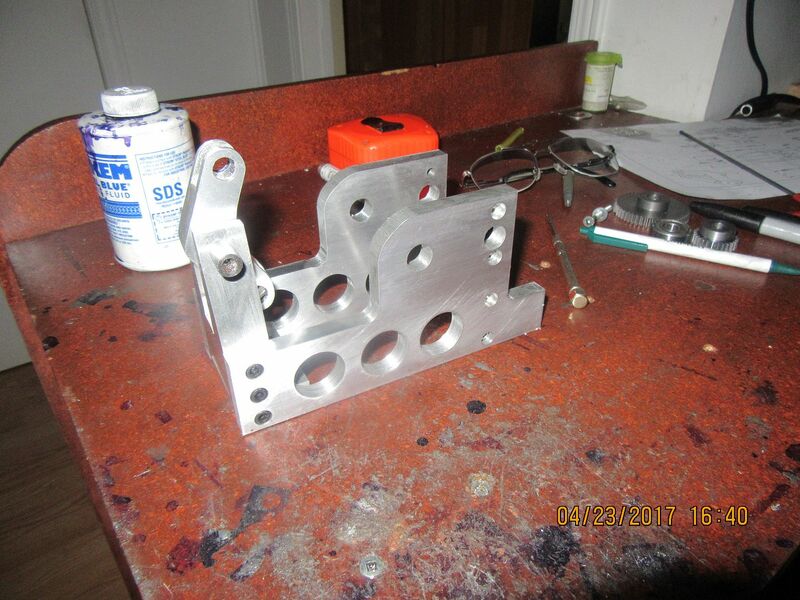 Brian, could you not have machined it on the vertical milling machine on a rotary table with less strain on your nerves? Awemawson--The thought did cross my mind. I opted for the lathe because it is marginally quicker. 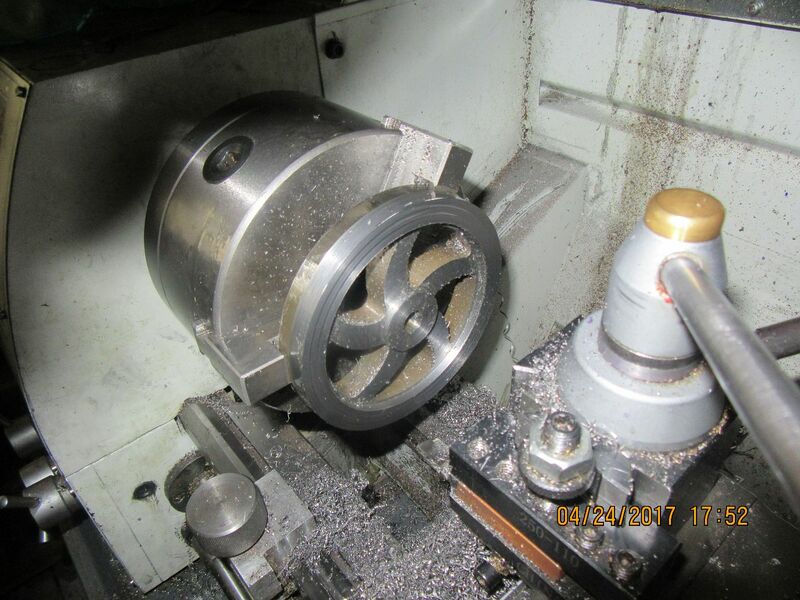 I have a 3 jaw chuck mounted on my rotary table, and I think that with the reverse jaws it could hold the part. Even so, considering a .010" depth of cut and a 3/4" endmill, that's a lot of cranking to put in a recess 1/4" deep. At the top of the very first posting in the thread there is a 'Notify' button.